UK: The 2011 London Open – held 12/28-31 in London — was won by YoungSam Kim 7d who won all his games. Lingjun Miao 4d was second came and in third was Yunlong Liu 3d. Click here for a more detailed report and results. Austria: Schayan Hamrah (at left) won the Austrian championship finals in mid-December. Click here for an interview with him. Spain: Alejandro Lopez 5k won the December 28 La Carboneria tournament, played in Sevilla, Spain. Romania: The Cluj-Napoca- City Championship, played December 16-18 in Cluj-Napoca, Romania, was won by George Ghetu 3d. Turkey: Ozgur Degirmenci 2d won the 19th Alpar Kilinc Memorial Tournament, played Dec 17-18 in ODTU/Ankara, Turkey. 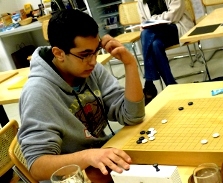 Switzerland: The 2011 Swiss Go Camp League, played Dec 16-19 in Montbonvon, Switzerland, was won by Semi Lee 4d.